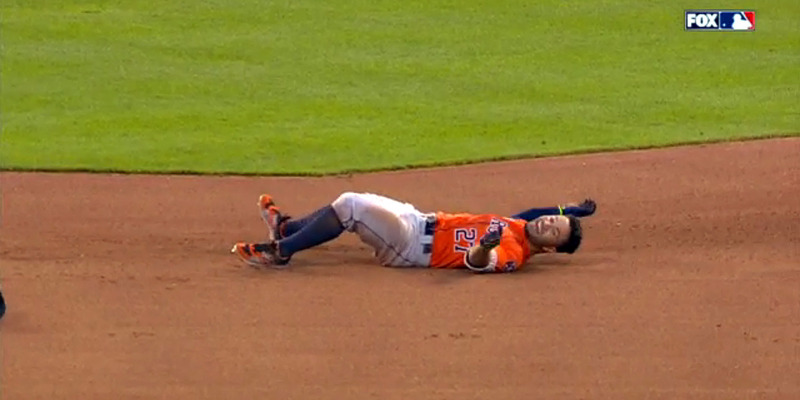 Houston Astros star Jose Altuve tripped 90 feet before adding another accomplishment to his dominant 2016 season. In the top of the sixth inning in a Saturday game against the Royals, the Astros shortstop had already hit a single, double, and home run, leaving him just a triple shy of hitting for the cycle. During his fourth at-bat, Altuve knocked a ball into left-center and began racing around the bases, his eyes on reaching the cycle. He would have become the first Astros player to accomplish the feat in three years and just the second in MLB this season. However, when rounding second base, Altuve tripped and fell and had to feebly crawl back to second, 90 feet short of getting a triple. Here’s an angle of his stumble. The Astros still won the game, however, and Altuve, hitting a ridiculous .348 with 103 hits, is a good candidate to accomplish the feat.